Soccer Injuries - prevention & treatment! Soccer injuries are very common and can keep players out for as little as one game, up to an entire season or can lead to players having to retire from the game all together. 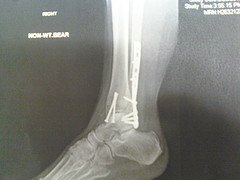 This page is dedicated to educating you about different injuries that players can obtain and how best to prevent them. There will also be some guidance on how to treat minor injuries. Unlike other sports, soccer is unique where you can use your head to your advantage and is a crucial part of the game. This does however cause more soccer injuries. The biggest cause of head injuries come from two playersclashing heads through both attempting to head the ball. Other head injuries come from elbows, arms even the feet making contact with a player. Fortunately, the head (skull) is very hard and takes a lot to cause serious injury. Other head injuries come from the eyes, nose and mouth - but are generally less serious. Soccer injuries which worry coaches, players and parents the most involve the brain. Much research has been done in the past looking at how heading a soccer ball may cause brain damage. No research thus far has 100% proved that heading a soccer ball can cause long lasting brain damage. Kids will complain that it hurts to begin with but the more they get used to it,the easier it becomes! The referee is allowed to continue a game of soccer if a player holds an injury unless it is a head injury. In this case the referee should stop the game immediately. 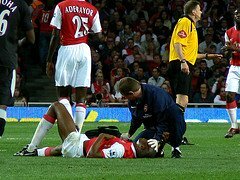 When treating a player who has a head injury be careful not to get them up or move them quickly because they may have a neck or back injury too. If a player appears concussed, ask them questions to see if they have been unconscious and if you have any doubt - sub them off and if need be go to hospital. Soccer injuries relating to the groin can keep players out for weeks if not months. This is a common injury that can resuly from a lack of stretching prior to the game. A groin pull is a n injury which occurs to the inner thigh muscles. These muscles help pull the legs together and can also cause problems with the hip joint. A pull relates to the over-stretching of a muscle. If a muscle is pulled it is abnormally stretched and causes the muscle to tear and will therefore take time to repair itself. FYSD has teamed up with our friends over at www.physiqz.com who have provided an excellent page on how to prevent 'footballers groin' AKA Sports Hernia Injury. For more information..... click here! The most talked about soccer injuries! A hamstring pull or strain once again relates to one or more of the muscles being torn. A sudden sharp pain at the back of the leg during soccer-most probably during sprinting or high velocity movements. Most muscle strains usually have a 3 grade criteris with 1 being mild and 3 being more serious. Hamstring soccer injuries can keep players out of the game for months. Treatment for a pulled hamstring must start immediately. RICE Therapy: Rest, Ice, Compress, Elevate. Help to heal soccer injuries by putting ice on any muscle injury, having plenty of rest and keeping the muscle if possible above the heart - you will signifcantly improve the recovery rate of the injury. It is the rush of blood that goes back to the injured muscle after the RICE technique that helps heal the problem. Ouch! When a bone breaks it is called a fracture. Every player and coaches worst nightmare for soccer injuries. A broken leg for example, will keep you out for at least 9 months. There are different variations of fractures. A 'complete fracture' is when the bone has broken into two pieces. A 'greenstick fracture' is when the bone cracks on one side only, not all the way through. A 'single fracture' is when the bone is broken in one place. A 'comminuted' fracture is when the bone is broken into more than two pieces or crushed. A 'bowing fracture', which only happens in kids, is when the bone bends but doesn't break. An 'open fracture' is when the bone is sticking through the skin. There's not too much more that needs to be said about broken bones except take the doctors advice and don't rush back. There are loads of different problems soccer players can get with their knees. You may hear the term ACL (Anterior Cruciate Ligament) which lies deep within the knee joint with a tear being most common. Turning, twisting and landing awkwardly can cause this. A knee brace can help some people but otherwie its to the surgery room i'm afraid. Runner's Knee is a painful overuse knee injury that affects the outer part of the knee. It is fairly common in runners and cyclists. Most cases of Runner's Knee respond well to physiotherapy treatment. The aims of treatment are to reduce inflammation using the RICE treatment as shown earlier. I suffer with this quite a lot. I don't roll my ankle in circles but instead go in squares (up/down - left/right). I have to use the RICE treatment after every game to reduce swelling and ensure it recovers quickly. Other times I fight through it with an ankle strap for support. Ankle soccer injuries are frustrating because they are not always the worst of injuries to endure but if it hurts to kick the ball or land on your standing foot - then soccer is going to be difficult! The ankle is a complex joint that is capable of a wide range of movement: flexion, extension, inversion and eversion as well as a combination of other movements. Sprained ankles are very common in sport and refers to soft tissue damage to the ligaments. The neck and shoulders are often forgot about in the pre-match stretching routine but can be bad soccer injuries. Majority of the time it is the soft tissue which gets damaged. Neck sprains are often caused by falls or sudden twists that overload or overstretch the joint. Another cause is repeated stress to the joint. Symptoms include swelling, reduced flexibility and pain. Sprains can be mild, moderate or severe. A neck fracture is a break in a cervical bone. It may be caused by trauma, a fall or degenerative changes in the spine. The angle of force hitting the neck and the head's position at impact often determine the type and severity of the break. Common soccer injuries, which are often less serious and most players get after every competitive game are aches and strains. This condition is not serious but can be disruptive and can cause the sufferer to stop or reduce their activities, which can also lead to sadness, depression and anxiety. Muscle pain is generally classified into two categories. The first is soreness, inflammation and stiffness that develop as the result of either bad posture or over exercising -- you can develop these symptoms by undertaking a strenuous soccer game or simply walking the dog. The second type of muscle ache and pain is when a muscle suddenly contracts and can't relax, the result is known as a cramp. Typically, the areas most commonly affected by cramp are calf, foot, or thigh. Cramps can develop at any time and may even develop when sleeping. Cramps are believed to be causedfrom a lack of proper stretching, a lack of minerals in the diet and dehydration. 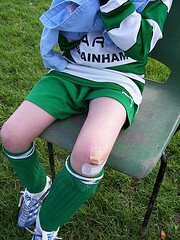 Cuts and grazes are some of the most common injuries. Minor cuts and grazes (where only the surface layer of skin is cut or scraped off) may bleed and feel slightly painful, but the affected area will normally scab over and heal quickly. However, if the cut is in an area that is constantly moving, such as your knee joint, it may take longer to heal. Depending on how deep the cut is and where it is on your body, a scar may remain once the cut has healed. Deeper cuts may damage important structures below the skin, such as nerves, blood vessels or tendons. Bruises are generally surface injuries that develop from mild trauma such as a bump or fall, and are the result of ruptures or tears in the small blood vessels just beneath the skin. As a result of such injuries blood escapes beneath the skin causing the distinctive blackish or bluish color associated with bruising. Under normal circumstances in healthy individuals bruises will heal naturally, and depending on the size of the bruise this could take anywhere from two to four weeks. Pain that occurs in the calf muscle on the lower part of the leg often is the result of a pulled or torn calf muscle. This is called a calf strain or a calf pull. It occurs when part of the muscle of the lower leg (gastrocnemius or soleus) is torn away from the Achilles tendon. This injury happens during acceleration or changes in direction. The torn calf muscle may spasm, and contract forcefully. The toes will point down. Bruises show up in the foot and ankle due to pooling of blood from internal bleeding. Just like other muscle injuries, a calf injury has three grades of severity. The Achilles tendon is the large tendon at the back of the ankle. It connects the large calf muscles (Gastrocnemius and Soleus) to the heel bone. Achilles tendonitis is an overuse injury. Too much too soon is the basic cause of overuse injuries. The only thing you can really do is apply the RICE treatment. 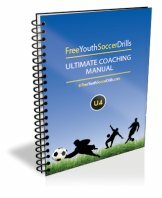 Leave Soccer Injuries - go to homepage!